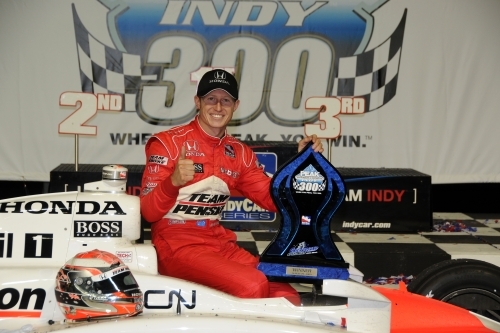 Ryan Briscoe snatched IndyCar victory at Chicagoland by just 0.8 seconds on Sunday to take his third victory of the season. The BRDC Full Member lead the first half of the race but had an issue at a pit stop which looked like putting the Australian’s race in jeopardy. But Ryan soon got back into the lead although he was not to have it all his own way as he got caught in traffic on lap 75 and finished up back in fourth. Another pit stop issue saw him down in tenth but he soon worked his way through the field to regain the lead again ready to take the chequered flag. Dario Franchitti finished the race in fourth while fellow BRDC Full Member Justin Wilson was tenth and Mike Conway 16th. There were celebrations for BRDC Associate Member Andy Stevenson the Belgium Grand Prix at Spa Francorchamps on Sunday as Force India celebrated their first pole position and then their first podium with second place. Giancarlo Fisichella put in the drive of the weekend as this was Force India’s first ever Formula 1 world Championship points, with whom Andy is Team Manager. Rubens Barrichello was the highest BRDC Member to finish the race taking seventh place. The Honorary Member just managed to keep his Brawn going until the chequered flag despite obvious issues with his Mercedes engine, before driving down the pit lane after the race with flames coming from the side of the car. Mark Webber finished the race in ninth but there was no dream finish for either Jenson Button or Lewis Hamilton as both had to retire following a first lap multi car incident. Karun Chandhok finished seventh in the second GP2 race of the weekend on Sunday at Spa Francorchamps. David Brabham’s ALMS championship lead was extended on Sunday as he claimed victory at Mosport Park. Marino Franchitti was forced to pit earlier than planned after being left with oil on the windscreen of his Lola B09 86 Mazda, which was frustrating for the BRDC Full Member as he had pushed himself as high as overall second place at one point. Marino was to finish fifth overall and second in the P2 class. The Rollcentre Racing Mosler GT3 of Full BRDC Member Martin Short and former Rising Star Jon Barnes took a win by a lap in the VdeV three hour endurance at Dijon last weekend.